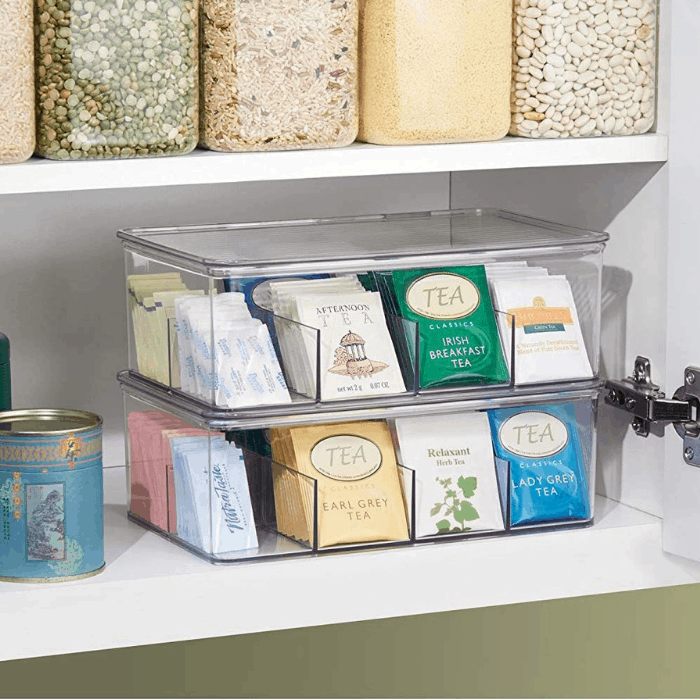 Forget About Your Cluttered Pantry With These Pantry Organization Ideas! 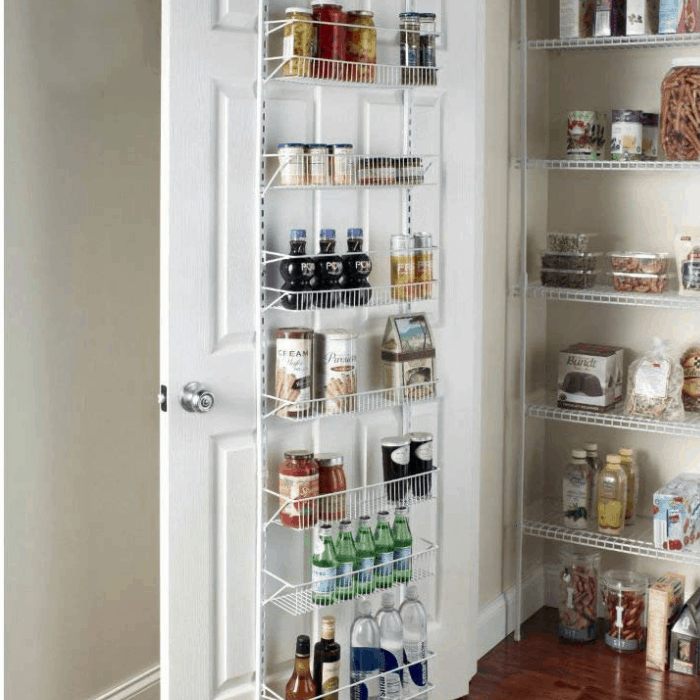 Are you looking for ways to organize your kitchen pantry? 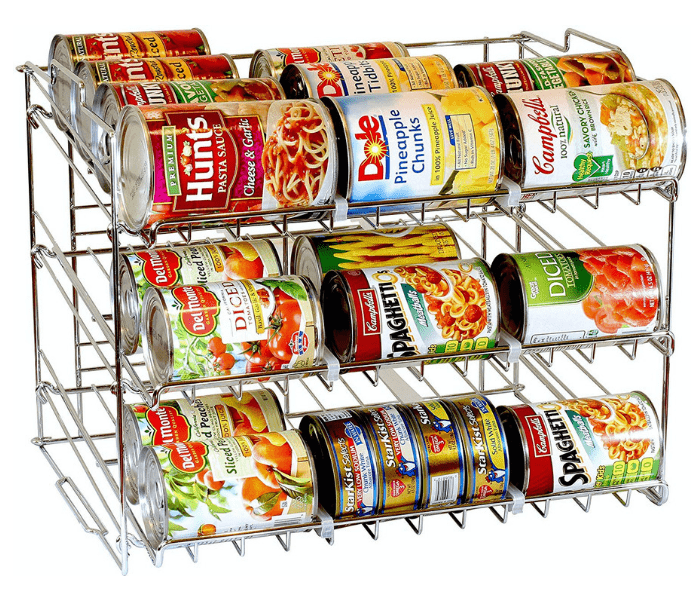 These 8 pantry organization ideas will be very helpful to you, if you are. 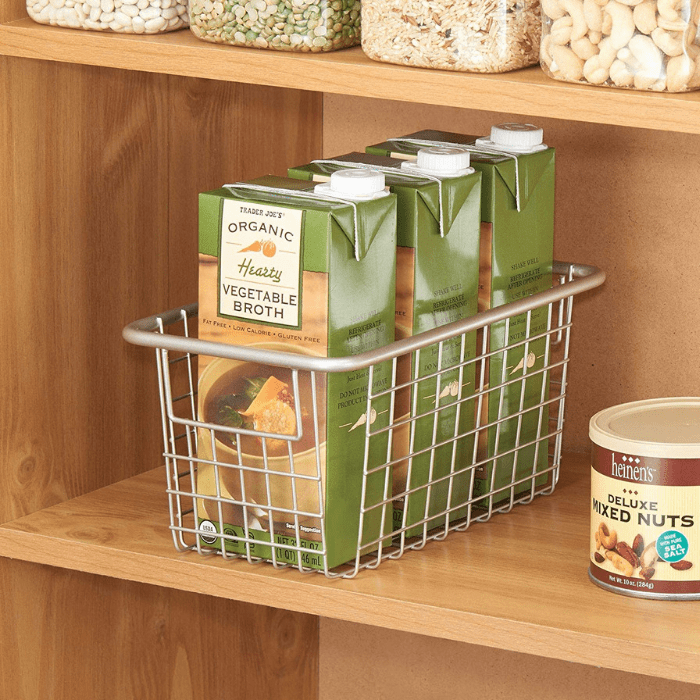 From over the door pantry organization to pantry shelf organization, we’ve got you covered! 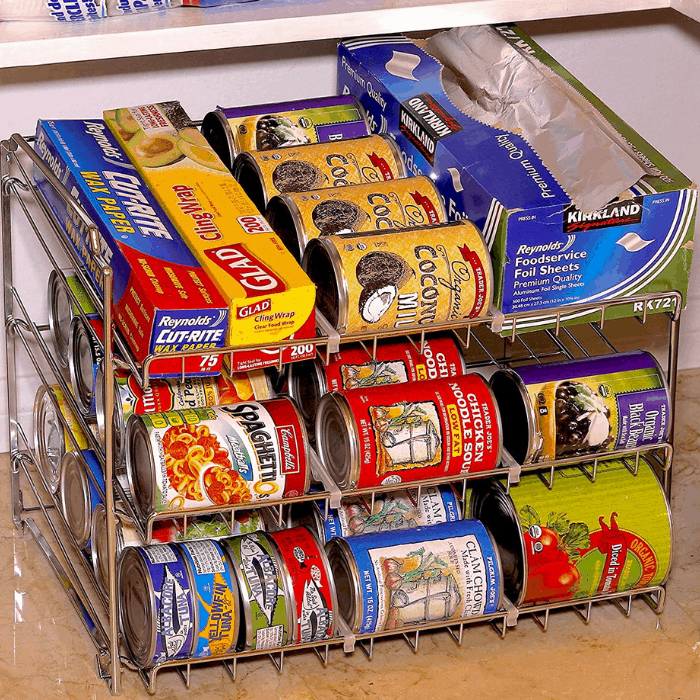 If you are not careful, your pantry can be a disaster! 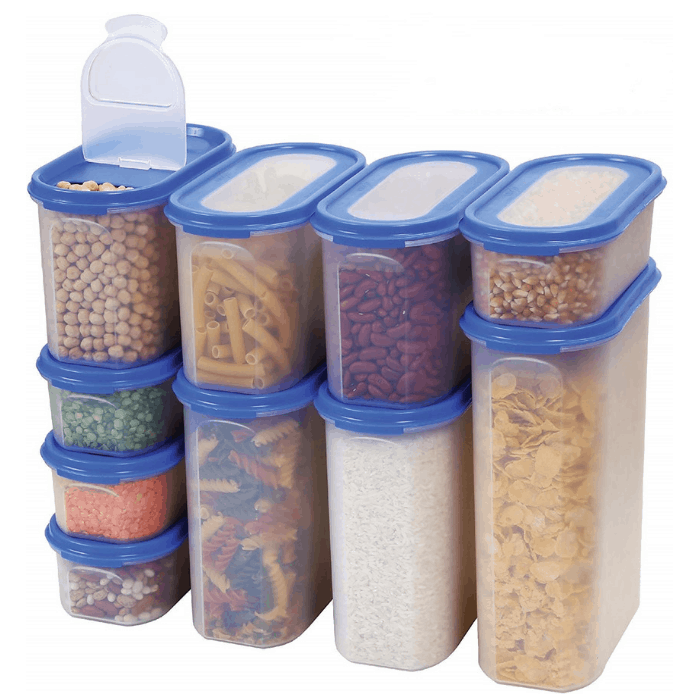 Half-empty bags of snacks and chips and food containers can leave the pantry cluttered and chaotic. 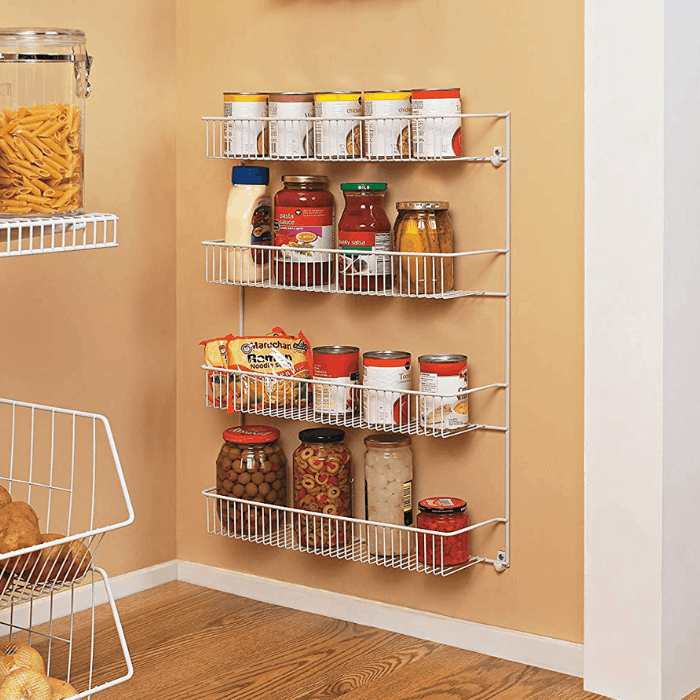 Organizing your pantry helps you to see what food you have, what you need to restock, and what’s missing completely. 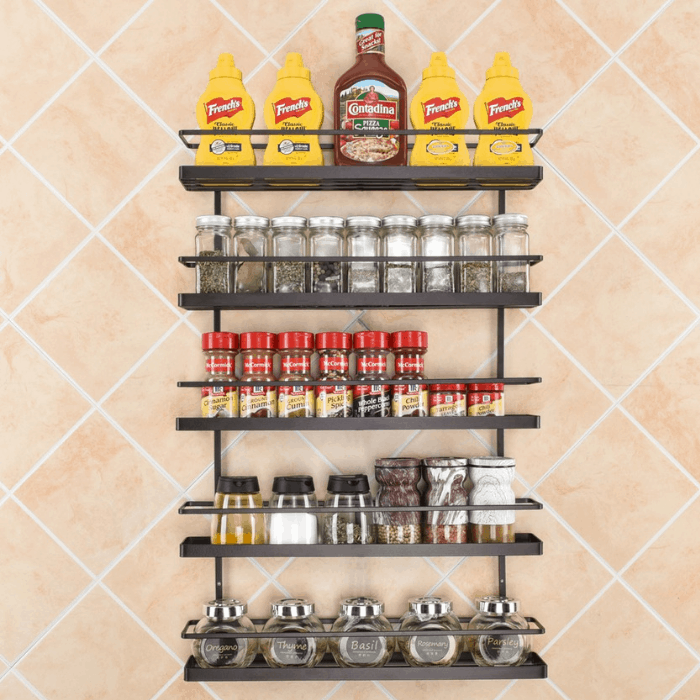 Getting your pantry organized will go a long way in making your meal preparation easier and faster. 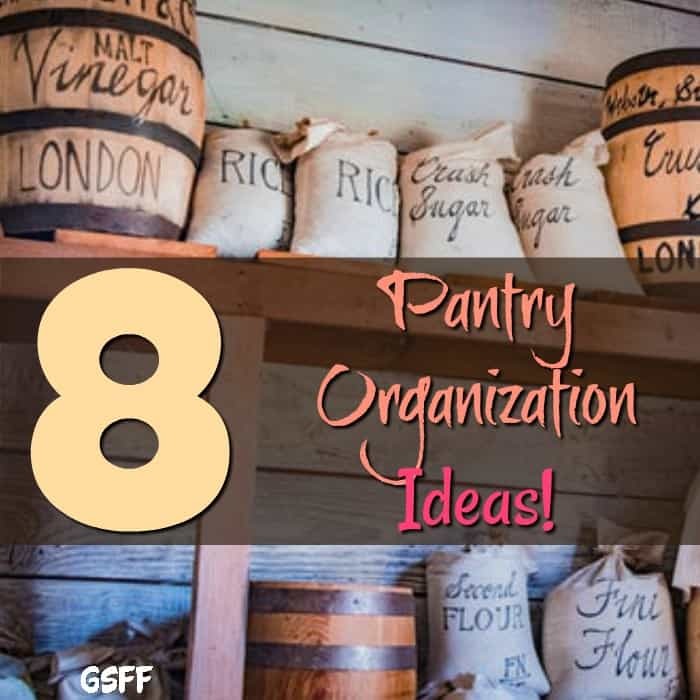 Let’s get started organizing the pantry with the help of these pantry organization ideas! 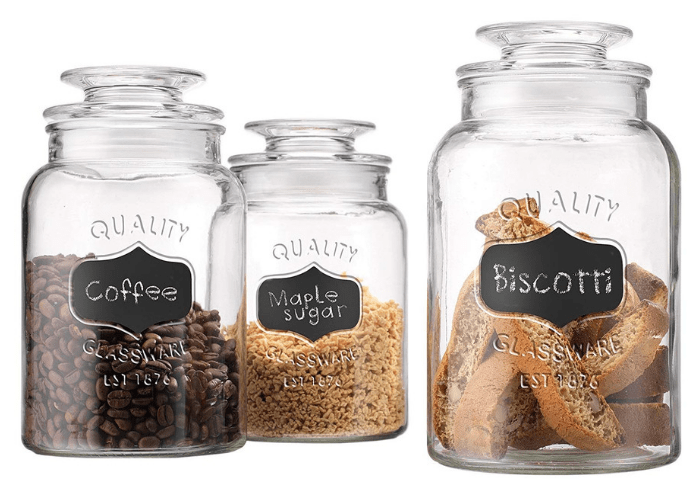 Transfer your pantry staples like flour, sugar, coffee, and baking soda into see-through canisters. This will not only preserve the freshness, but, it’s easier to spot when you’re running low on something and you need to restock. 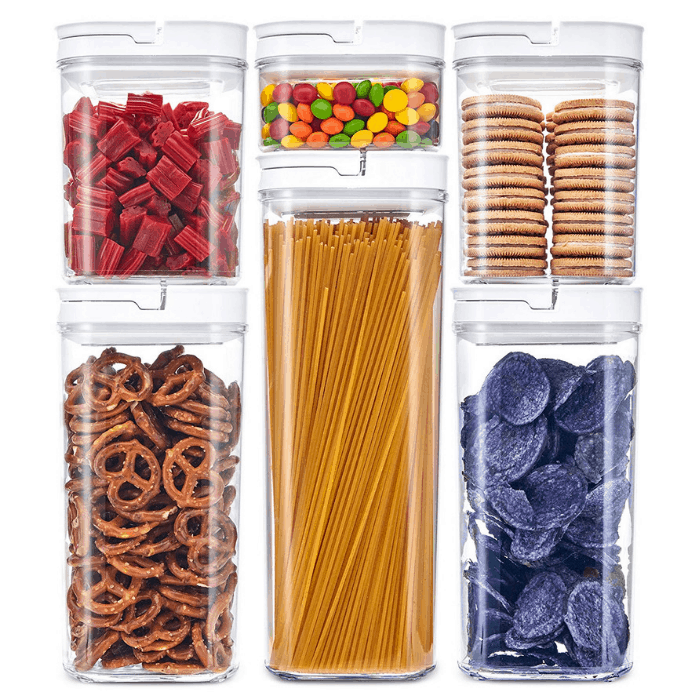 There are a lot of stackable canisters available, helping you utilize all the space between your pantry shelves. 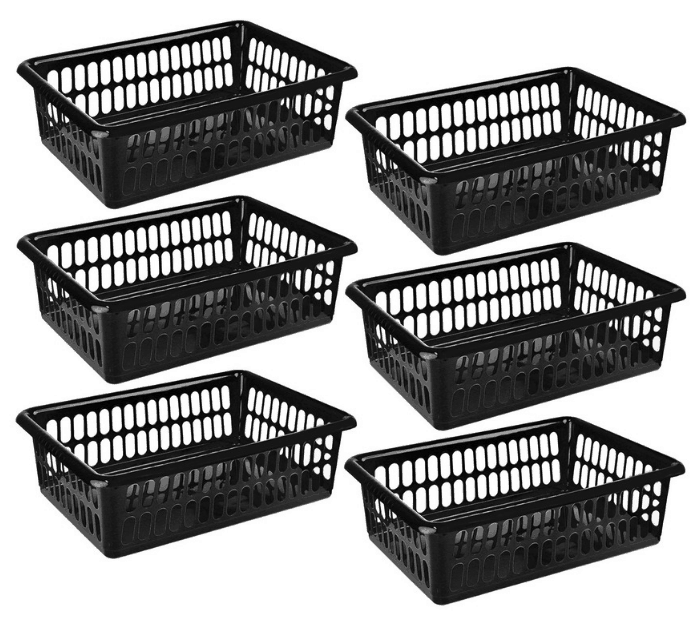 Group like items together in a bin and label the bins. 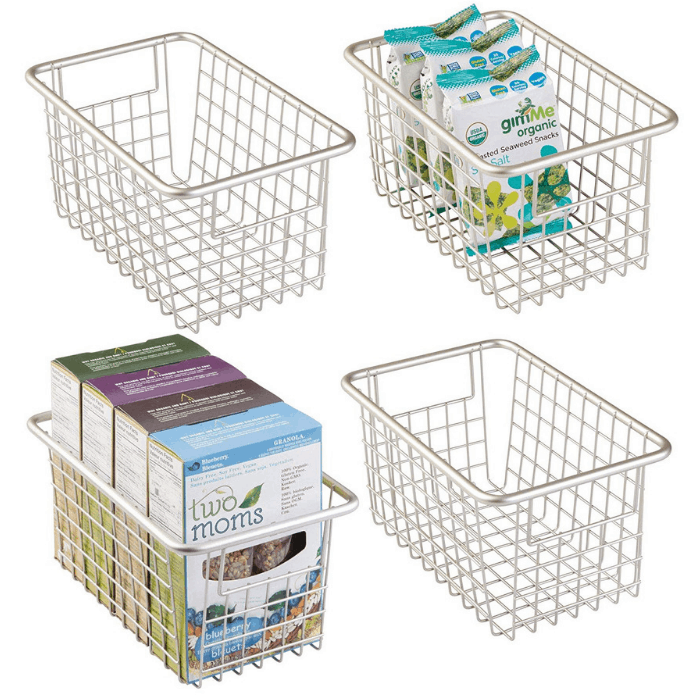 You can group the containers for baking supplies in a single basket. You can also place snacks in another one. 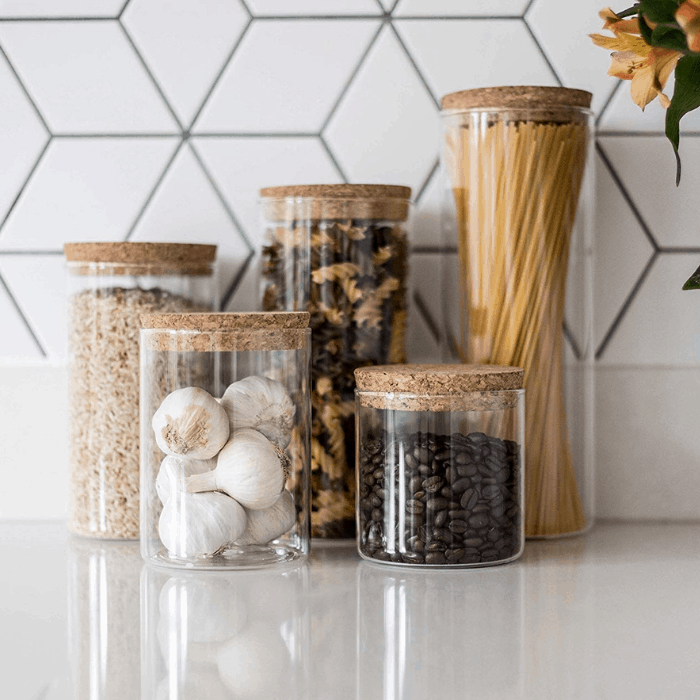 Grouping your canisters and jars in a basket will make it easier for you to get the ingredients that you need during meal preparation. It also makes the shelves look more organized too. You want to be able to see the contents of bags and boxes every day so you can tell when you’re running low. 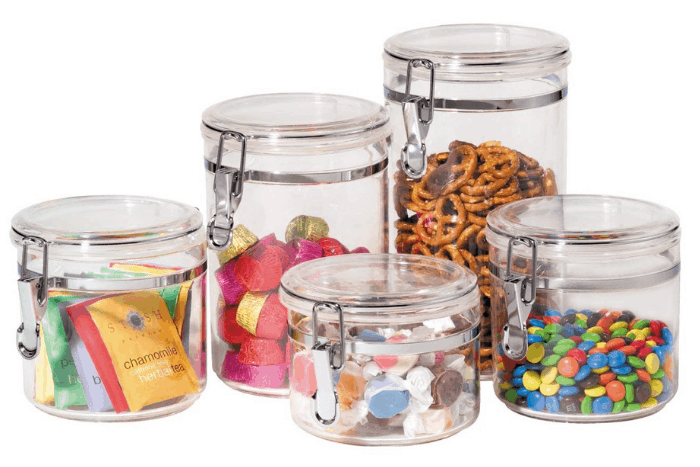 One of the quickest and simplest way to organize your pantry and make it look neat is to transfer those items into matching clear jars. 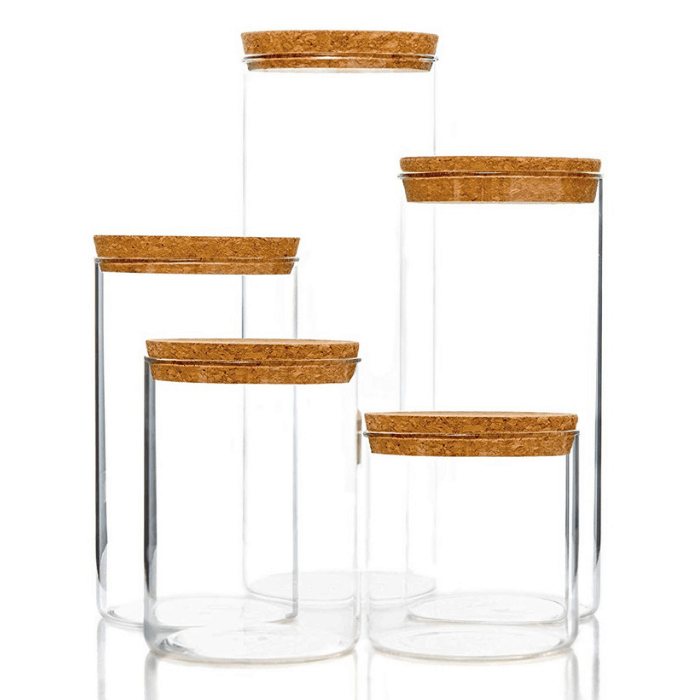 Different items like snacks, flour, seeds, nuts, and dried fruits can be displayed in clear glass jars. 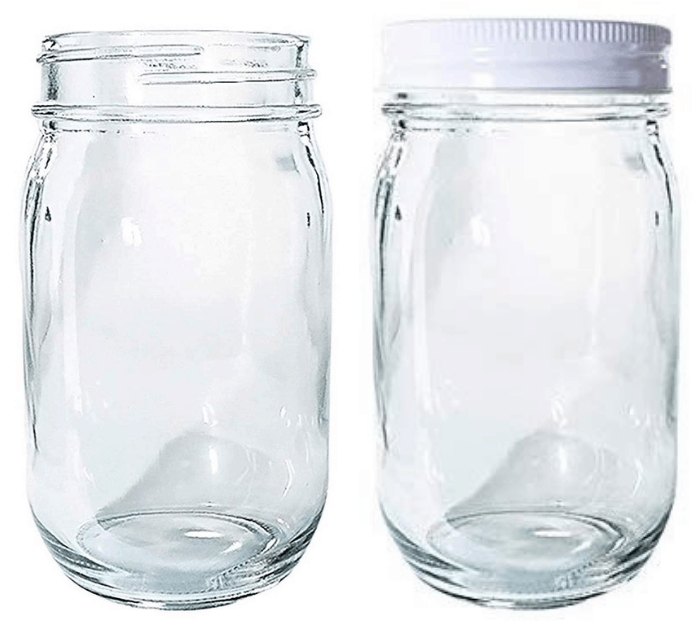 It will not only be easier for you to spot the food that you need, these clear jars also make the open shelving or countertops look pretty. Make the best use of the door. The inside of your cabinet doors also offers valuable storage space. 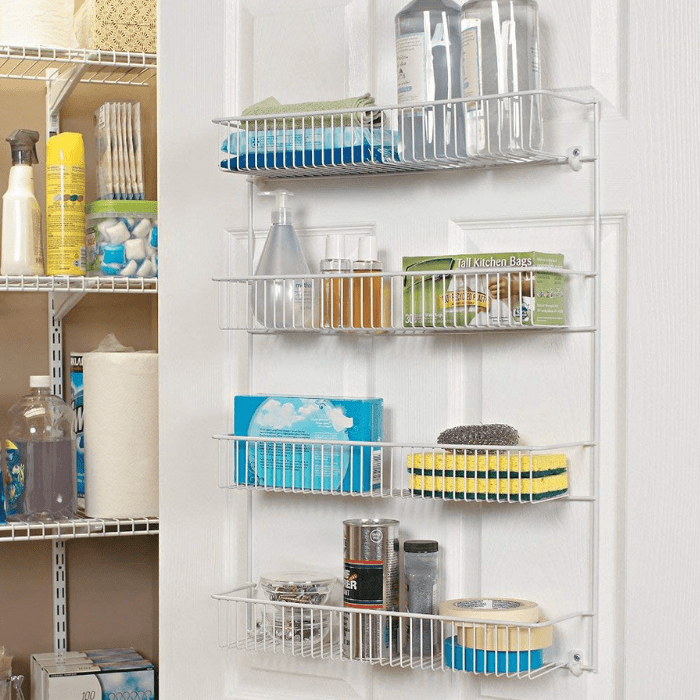 Place door organizers on the cabinet doors and use it to store everything: From wraps to ziplock bags and garbage bags. 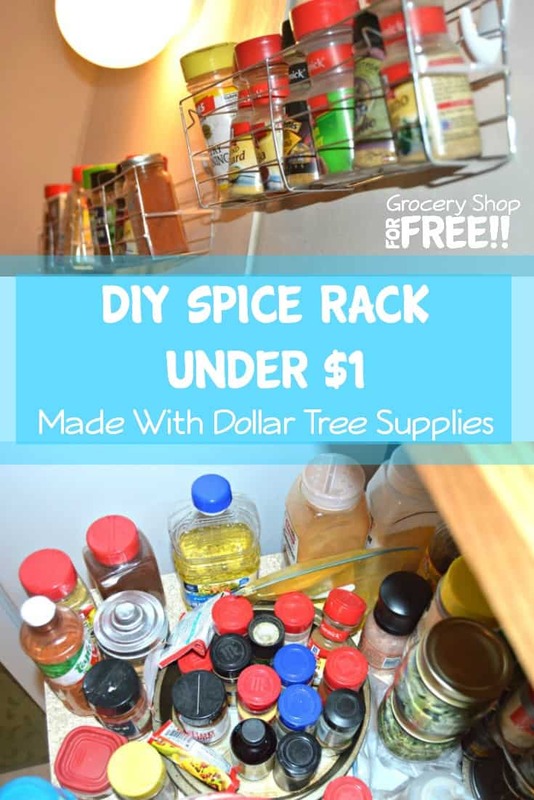 You might also like to try my DIY Dollar Tree Spice Rack Under $1, too! Label everything in your pantry. 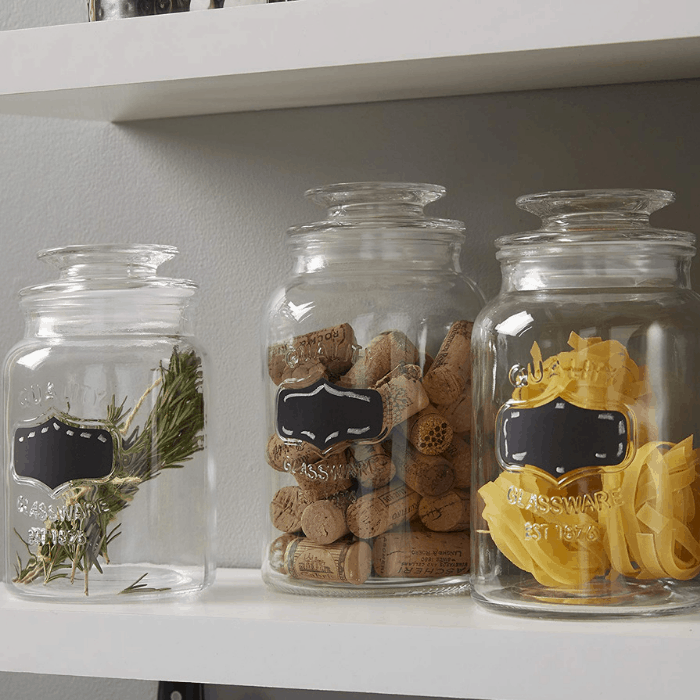 Do you have a lot of storage jars and keeping them all labeled is a tough job? 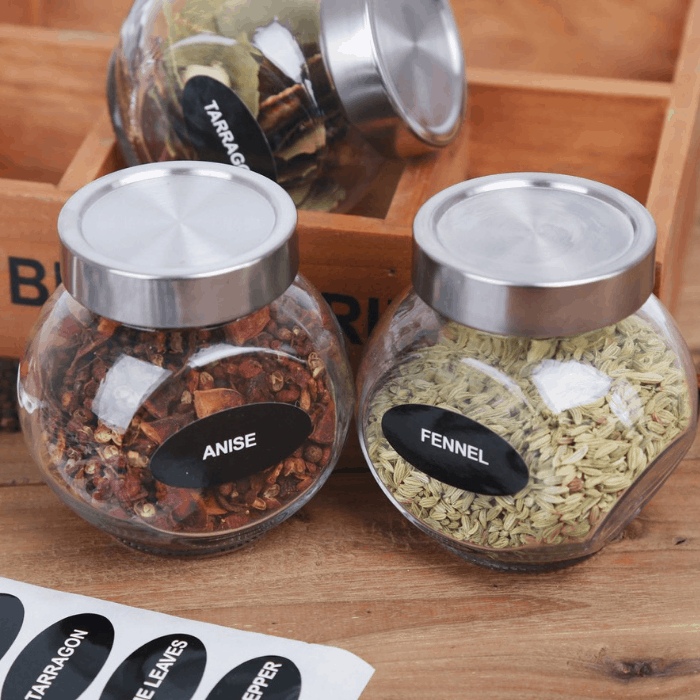 Make the process of finding the right spice or baking item fast and stress-free by adding labels! 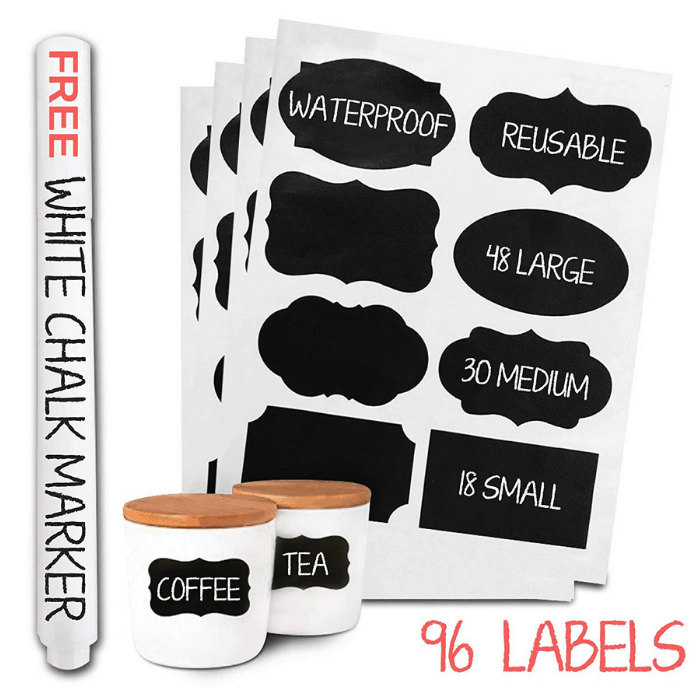 There are a lot of different types of labels available: From label stickers to stick-on chalkboard labels. Just attach them to the jars and canisters and you’re set. 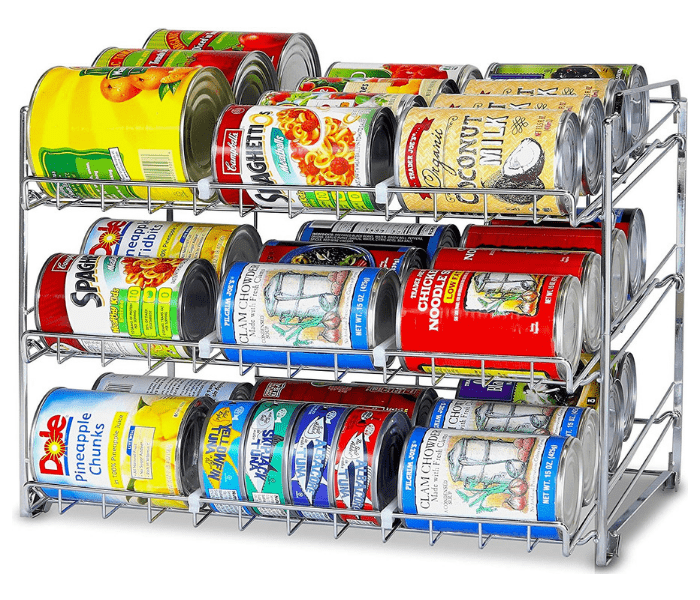 Keep your cans neatly arranged and easily visible so you always know what you have with a stackable can rack organizer. You can also make it so that the ones that expire the latest are in the back and the ones that need to be used first are up front. 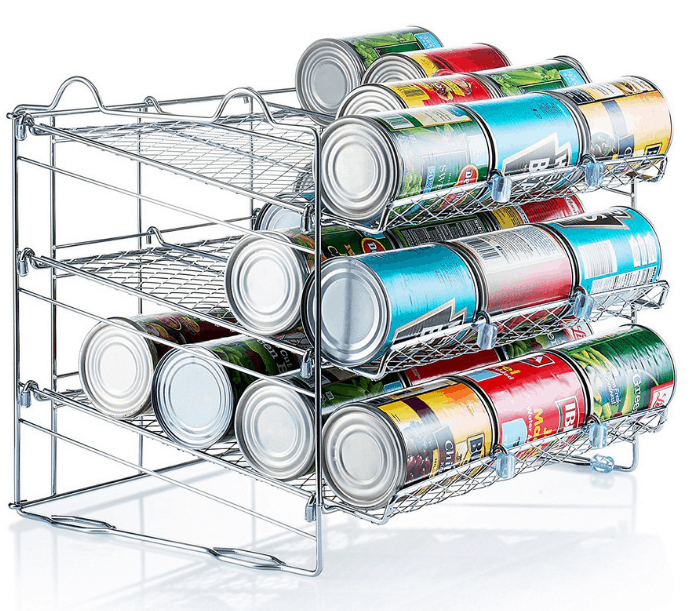 This can rack organizer is great for pantry shelves, cabinets, and even countertops. 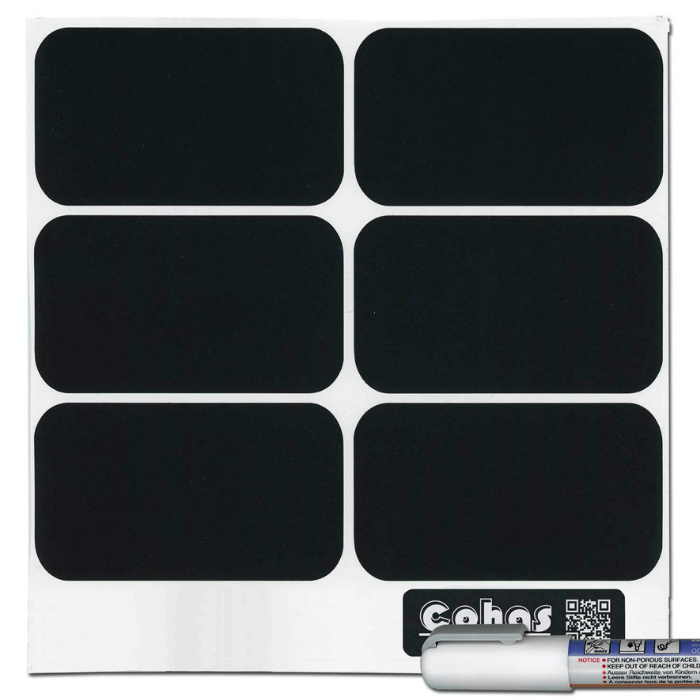 They are stackable and can instantly double your storage capacity. 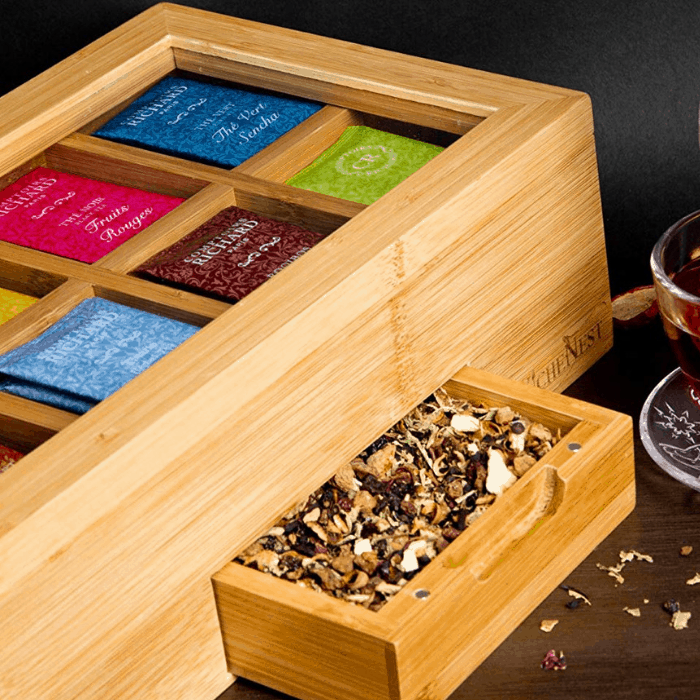 If you love tea, there are times when you simply forget the old boxes of tea you have and you end up buying a new ones. 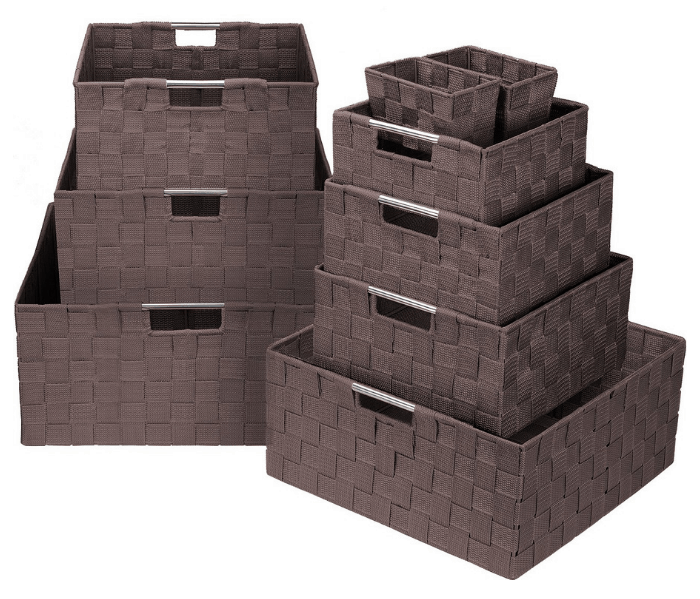 You might be surprised after cleaning your pantry, you still have two extra boxes. 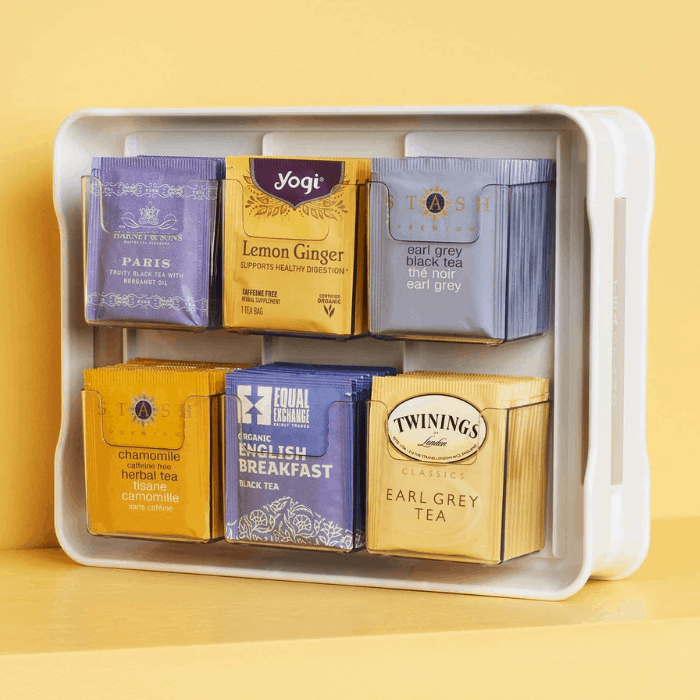 The tea boxes may take up a lot of space! 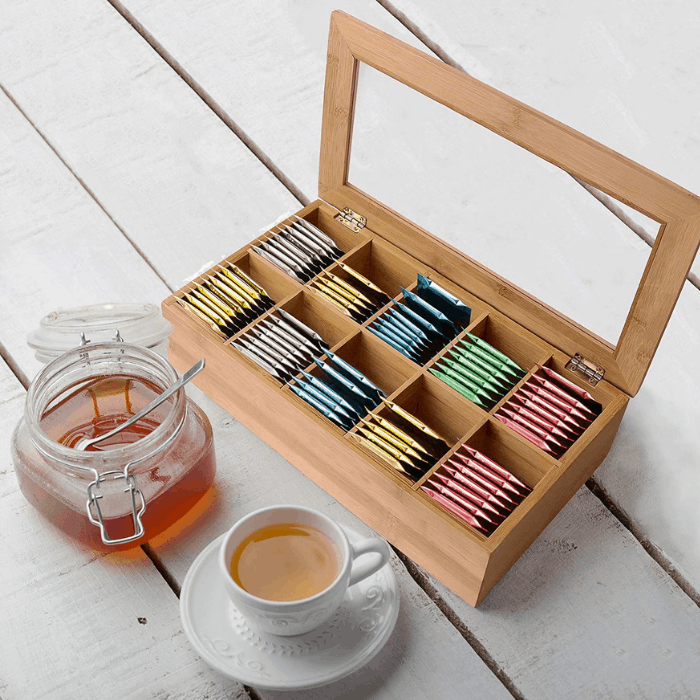 Using a tea caddy will not only save you valuable space, it can also help you organize the different types of tea you have — all in one place. 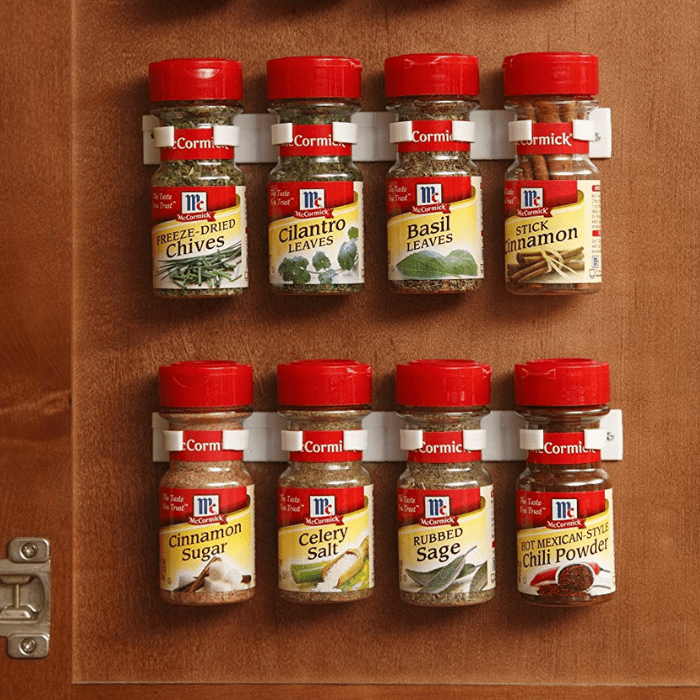 If you want to have a clutter-free pantry, cabinet, or drawer, group your spices. However, if you have a lot (like me! ), they might take a lot of space. 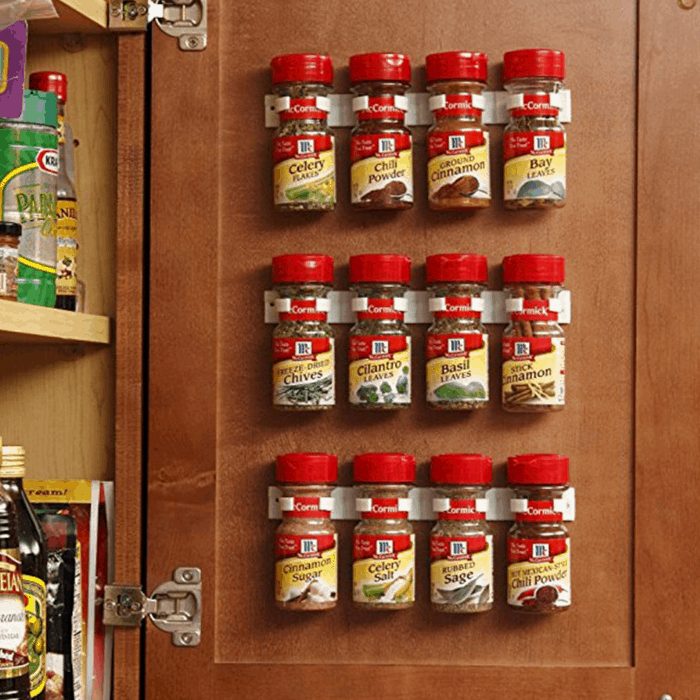 An adhesive spice grip is the perfect choice for your pantry. 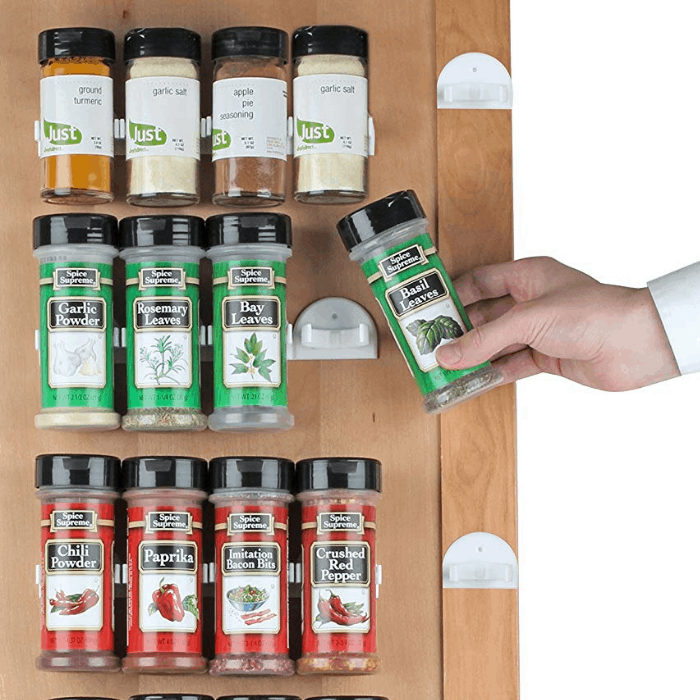 They can hold and organize up to 36 spice jars on the wall or inside the cabinet door. 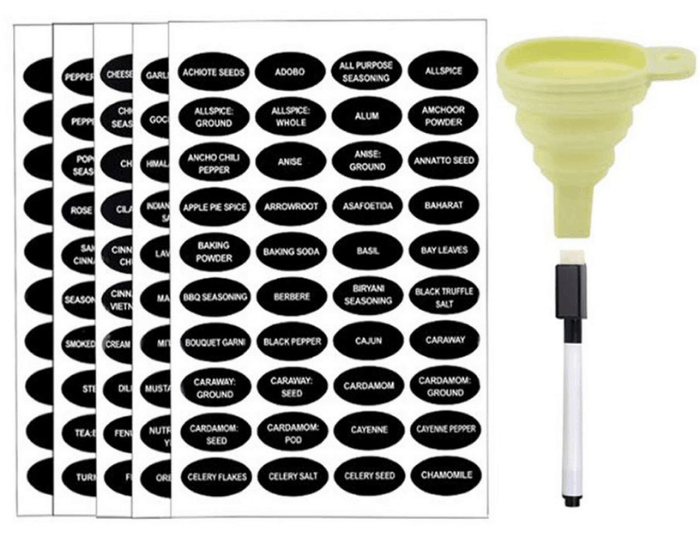 These spice grips can also provide a quick, easy view access to what you have. 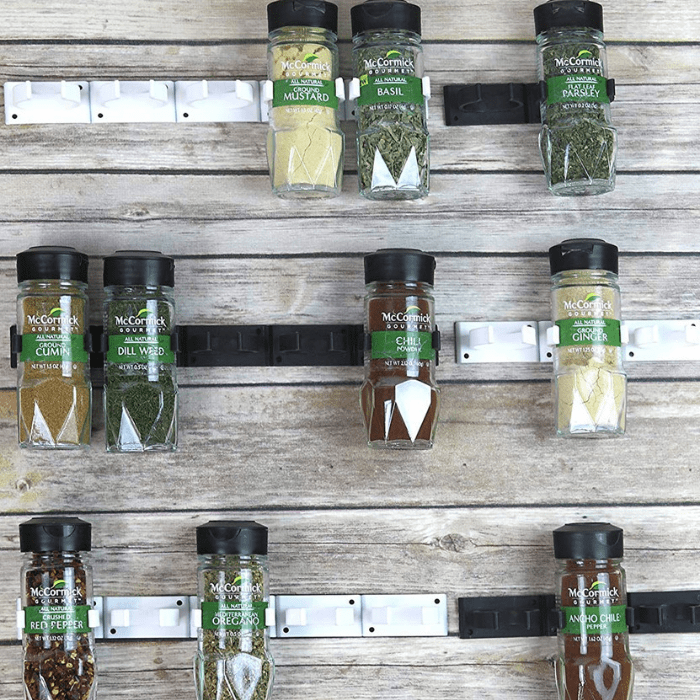 You don’t need to transfer the spices into special jars — just stick them where you want them and start organizing your spice jars. 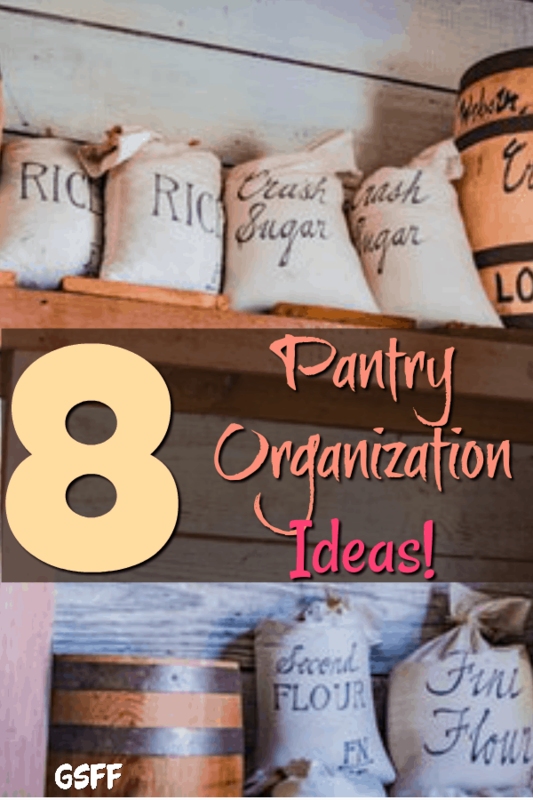 Organize your life — starting with your pantry and these pantry organization ideas! 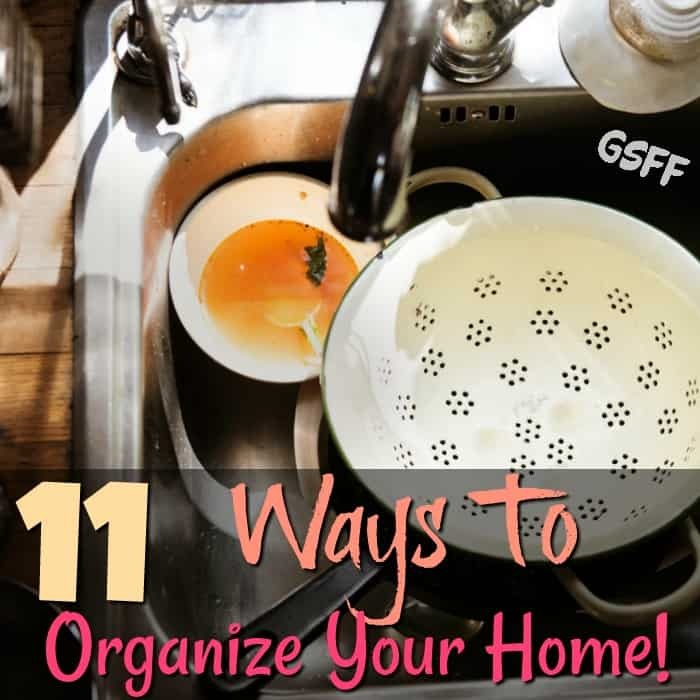 Your life will be easier and clutter-free, plus, you’ll be surprised at how much space you save and money, too, because you aren’t throwing away forgotten products!